“Can’t we women make our own contribution to jazz by playing like women,” asks pianist Marian McPartland, “but still capturing the essential elements of jazz—good beat—good ideas—honesty and true feeling?” Blazing the trail for gender equality, McPartland contributed this quote in her 1957 article “Playing Like a Man” in the London publication Just Jazz. Seattle writer Paul de Barros honestly captures these female contributions, ideas and feelings in Shall We Play that One Together? – The Life and Art of Jazz Piano Legend Marian McPartland. The 496-page biography released by St. Martins Press on October 16 features a black and white cover photo of a young brunette McPartland at the piano, smiling a playful glance at the camera over her right shoulder. The photo and book title embody the story de Barros tells – a poised woman enjoying herself and asking you to share in the fun. The title is an invitation 94 year old McPartland routinely poses to her musical guests during the past three decades of her National Public Radio show Piano Jazz. This is an unusual situation for a jazz biographer – the subject is alive, the subject has decades of control over her own story, there is a complete archive of material and the author needs to expand the scope and veracity of the story by collecting more original source material. The bar for correct information is higher than ever. De Barros established a brief written agreement that McPartland could review the book for inaccuracies but he would have the final cut. All this information and detail doesn’t grind the reader to a halt. De Barros crafts a narrative that reads like an interesting novel. Scenes are established in vivid detail – replaying Chopin by ear at age three, discovering her perfect pitch at age six, a conservatory professor overhearing her practicing Art Tatum transcriptions, her astonishment at hearing bebop on record for the first time, Lenny Tristano’s lesson of improving her time, George Shearing’s suggestion that she become more outspoken, Duke Ellington’s advice to play fewer notes and her husband, jazz cornetist Jimmy McPartland, supporting her independent career. McPartland’s choices evolve with some asides of informed questions by de Barros about her motives. Chapters end with McPartland at dramatic precipices that keep the reader turning pages. Simultaneous threads of artistic development, discography, personal relationships and professional growth are braided with skill. Fans of McPartland will find much more to her story than anything previously published. “I found in one of Marian’s file drawers an unpublished 110-page biography of Jimmy McPartland that nobody but Marian and me has ever seen. 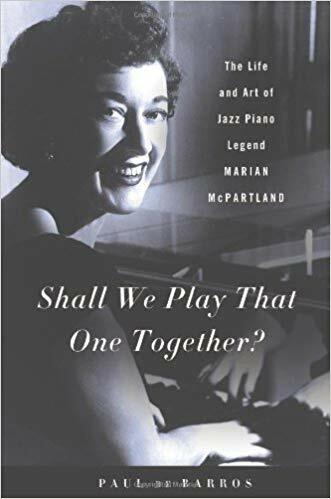 It was like a gift from the gods.” With Shall We Play That One Together?, de Barros gives us the gift of seeing McPartland’s generous contributions to the story of jazz. Visit https://www.seattletimes.com/author/paul-de-barros/ to read more of Paul's work.